New Delhi, April 12: After using stills from Shah Rukh Khan's Mohabbatein, the government on Friday shared a collage of photographs from the superstar's film Devdas, to make a creative appeal to citizens to make the best use of their right to vote during the ongoing 2019 Lok Sabha elections. Lok Sabha Elections 2019: Govt Uses Stills From Shah Rukh Khan-Starrer ‘Mohabbatein’ to Promote Voting. The Press Information Bureau (PIB), the publicity arm of the Ministry of Information and Broadcasting, tweeted the collage featuring SRK and Jackie Shroff. 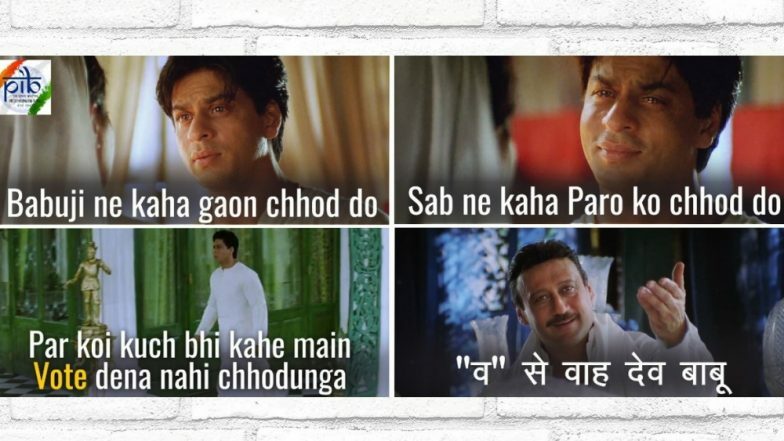 The image featured a recreated version of the movie's famous dialogue "Babuji ne kaha gaon chhod do...". It read: "Babuji ne kaha ghar chhod do, sabne kaha Paro ko chhod do. Par koi kuch bhi kahe, main vote dena nahin chhodunga." The picture was captioned: "Voting is citizens' right, responsibility and a duty. Don't get swayed by what people say. Be a responsible citizen, go out and vote. It matters." The Lok Sabha elections, which began on Thursday, will run till May 19.